Wanna learn how to kite-surf? Whether you're 16 or 66, simply grab your kite of choice and pump-pump-pump it up. 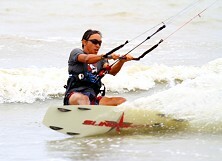 Kite-surfing is one of the fastest growing sports world-wide. And that's no wonder, given the relatively easy learning-curve, the blood-curdling high jumps, the immense air-time and the record-breaking speeds that kiters almost routinely attain. Our officially IKO-certified kite-board instructors at Tanjung Resang are not only pros at passing on their skills, but they never lose track of their number one priority: your safety. So go on, suit up and get some air! Our courses are broken down into individual modules so you can follow and complete each one separately and sequentially, or just take some lessons by the hour to spruce up your skill level. This way, you can always come back and pick up where you left off when weather conditions change or you prefer to come back at a later date for other reasons. We offer a number of lesson and rental packages, so drop us a line if you're interested in feeling the rush of kite-boarding. We'll give you a full overview of the cost of lessons and/or kite rental. ***Please note: All sailing activities are subject to weather conditions.